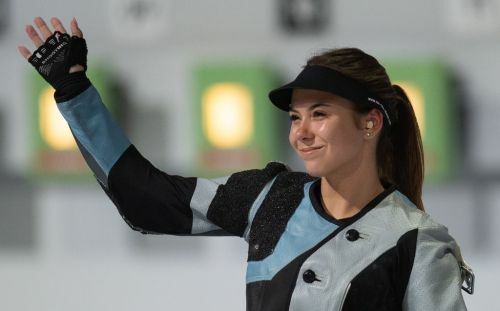 The 10m Air Rifle event for women at the 2018 Youth Olympics turned out to be a thrilling encounter in the finals at the 2018 Youth Olympics in Argentina. Stephanie Laura Grundsoee of Denmark was the initial leader after the first five rounds scoring 52.7 leaving the Indian trailing by 0.3 points. However, the Dane shot a 9.6 in her sixth round which restored the lead to the Indian by 0.7 points. Victoria Michelle Venning Rossiter from Australia was the first person eliminated to finish in eight with 118.9. Sofia Benetti’s impressive scores with her last four shots still found her shot by 0.8 points as the Italian had to be content with a seventh-place finish. Russia’s Anastasiia Dereviagina would be hard done with her sixth-place finish after she led the Chinese Wang by 0.4 points after twelve shots. But the Chinese shot a couple of heart-stopping 10.9’s to surpass the Russian and then followed it up with solid scores to eliminate Anastasiia. China’s Zeru Wang's incredible streak continued with a pair of 10.4 and 10.6. But the deficit was too large to overcome for the Chinese as her poor start dented her chance of a medal. She finished in the fifth position with a score of 185.8. Anna Janssen of Germany lost a medal with a mediocre 9.7 effort off her twentieth shot which left her reeling in the fourth position with a score of 206.5. Marija Malic from Serbia was never in contention for the Gold or Silver after her efforts of 9.6 and 9.8 left her with a score of 226.2 to secure the Bronze. 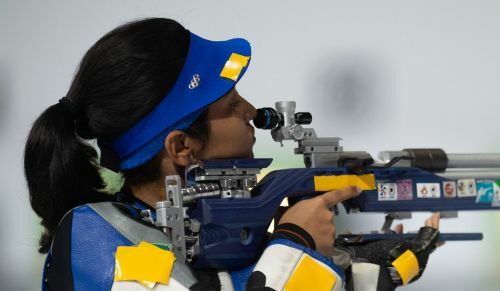 Mehuli Ghosh of India was ahead of the Danish shooter by 0.8 points with two shots remaining to decide the medals. The Dane reduced the margin by 0.6 after notching up a 10.6 with her penultimate shot. Ghosh shot her worst score of 9.1 in her last effort had to be content with Silver after scoring 248. Stephanie Laura Grundsoee of Denmark would be thanking her lucky stars as Ghosh’s final score of 9.1 was her only blip below the ten-point score. Her solid last effort of 10.4 clinched her the Gold.